Whilst there were many specifications within the Coupe range eg. "S" , "SE" , "Silver & Black Edition", "Settant anni", there were only two actual versions. The original version is referred to as a D8, and the later version (which came in towards the end of 1999) is the D9. The D9 had many revisions from the original D8, these included revised engines, electrical systems and dashboard controls. The easiest and most obvious differences to spot between D8 and D9 versions are on the dashboard. 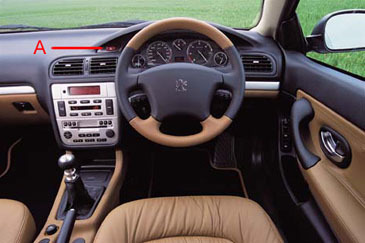 There are differences with some radio and/or heater/aircon controls, but as these can vary between specification, the most reliable method by far to identify whether a car is a D8 or a D9 is to note the position of the hazard warning light switch. 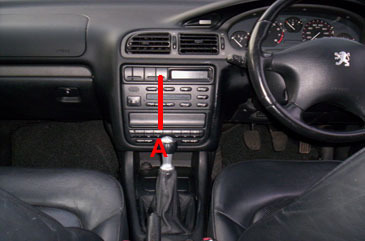 The pictures below show how the position of the hazard warning light switch is completely different between a D8 and a D9. The three litre V6 D9 version will most likely have the multiplexed 210bhp engine, however there were a number of cars produced during the cross over period that despite having the revised dashboard (including the repositioned hazard warning switch) but were still fitted with the older 194 bhp engine. These vehicles will be registered in 1999/2000. If you're still not sure which you have, have a look at your engine and then check out the engine section where you'll be able to find photographs of both the 194bhp and the 210bhp engines and you can match yours up.